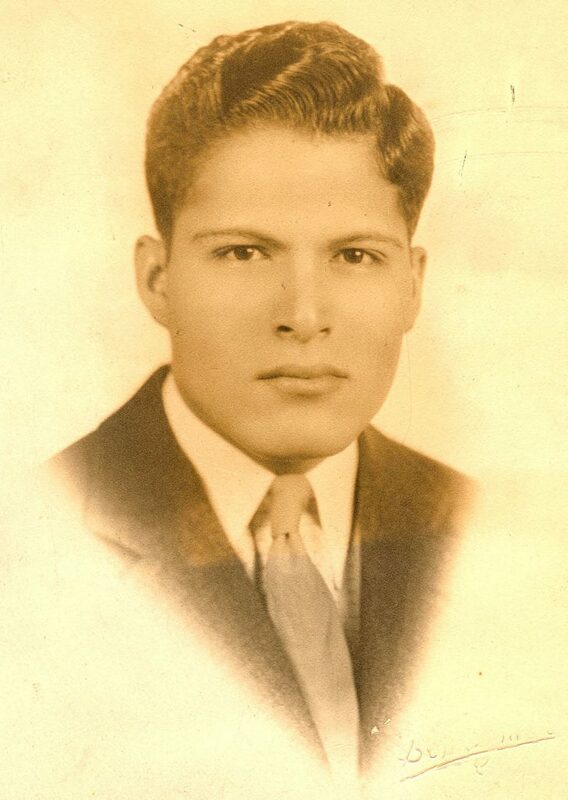 John R. Cervantes was born near La Piedad, Michoacán, Mexico on October 17, 1915. His family risked the uncertainties of illegal immigration to come to the United States in 1920. They worked on the railroads in Texas and the beet fields in Montana before establishing a home in Moline, Illinois in 1925. Here John found a warm, nurturing environment that made him feel like a real, proud, and happy American. Jack, as he was called, was very active during his time as a student at Moline High School, participating in dramatics, forensics, glee club, intramural basketball, and varsity football. After suffering a broken ankle in football practice, he became a cheerleader for his senior year. Jack’s dreams of going to college were dimmed when he suddenly lost his father to pneumonia just months shy of his high school graduation. Jack was the oldest of seven children, and the death of his father left the family with little means of financial support. With an excellent academic record and the help of scholarships from several Moliners and from the Moline Chapter of the Daughters of the American Revolution, Jack attended Augustana College in Rock Island for two years before transferring to the University of Illinois at Urbana-Champaign, where he earned a bachelor’s degree in education in 1938 and a master’s degree in romance languages in 1939. In 1943 Jack became an American citizen, joined the United States Army Air Forces, and served in the Pacific Theater during World War II. He married, started a family, and moved to Los Angeles where he enjoyed a distinguished 35-year career in education as a master teacher, counselor, and coordinator. He and his wife Mildred encouraged their children to appreciate the value of education, and all eight of their children went to college. John died in his home at the age of 93 on January 1, 2009, just months after he and his wife Mildred celebrated their 65th wedding anniversary. His wife preceded him in death in October 2008. This wonderful man, who was once a struggling, illegal immigrant, truly lived the American dream! The John R. “Jack” Cervantes Memorial Scholarship Fund fulfills another of John’s dreams to repay those who helped him.